On January 20, 1978, 21 inches of snow fell in Boston. The narrow streets of Boston were clogged with snow. It took a few days to dig out, but the city still had mounds of snow everywhere. The above photograph was taken in East Boston on Meridian Street, after about six inches of snowfall. Please note there is a line of cars behind the bus, all with their headlights on, in broad daylight. As part of their duties, Boston Firefighters had to dig out hundreds of fireplugs throughout the city for obvious reasons. 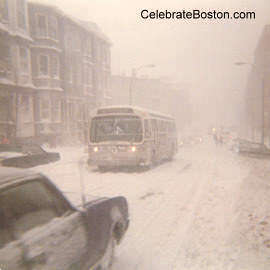 This storm was considered one of the worst in Boston's history. This author was less prudent in '78 and enjoyed taking photographs of the city during harsh weather. 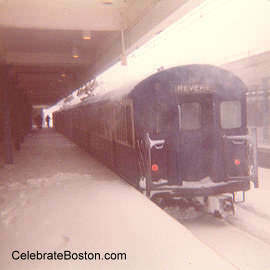 The photo above was taken of a train about to leave Orient Heights on February 6, 1978 heading for downtown Boston (note that the only footprints in the snow are mine). When this train traveled into the short tunnel near Airport Station, it was unable to climb the grade on the other side due to ice and snow on the tracks. The motorman shrewdly backed the train into the tunnel again, and operated the train in reverse from the last car, which was able to push the train up the other side successfully. When the train arrived at Maverick Station, the Blue Line was shut down. I had taken a train from Maverick to Orient Heights to take photos, and returned on the above train. I remember thinking after the blizzard, "Wow, if I went downtown, I would have been stranded for three days!" 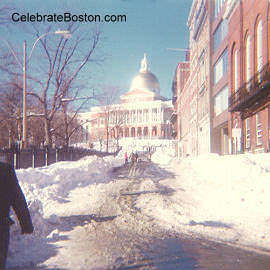 On February 6 and 7 1978, a then record 27.1 inches of snow fell in Boston. The storm quickly became known as The Blizzard of '78. Along the coast, the tides were devastating. At the height of the blizzard, the ocean storm surge rose 15.2 feet above the normal low tide mark. Many homes in coastal communities in Massachusetts Bay were completely destroyed. Severe flooding occurred in many low-lying towns. The storm strengthened during afternoon rush hour, and people were buried in their cars on the highways surrounding Boston. 99 people tragically lost their lives due to the storm. The value of all property destroyed was about $1.3 billion [or $2.9 billion current dollars]. 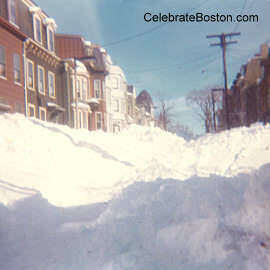 The above photo was taken of White Street in East Boston on February 8 or 9. Please note that cars are completely buried on both sides of the street, and some buildings had their first floors partially buried. Martial law was declared, and vehicular traffic was banned for several days. The National Guard was used to rescue people on the highways, and also using boats in flooded areas. Heavy machinery, dump trucks, and tow trucks were used for days to dig out streets and remove abandoned cars. The above photo was taken on February 12. Please note the absence of cars, with people walking right up Park Street. The Blizzard of '78 was the storm of last century. Some of the good that came as a result of the blizzard is mandatory evacuation of coastal areas during storm surges, and a "conditioned response" today by businesses to send people home early in bad weather, or to not open for the day when a large storm is forecasted.